Aspen and its ski areas have been a tourist destination and a gathering place for the rich and famous for decades. The town also consistently ranks at the top of America’s most expensive cities, based on high housing prices that keep climbing. 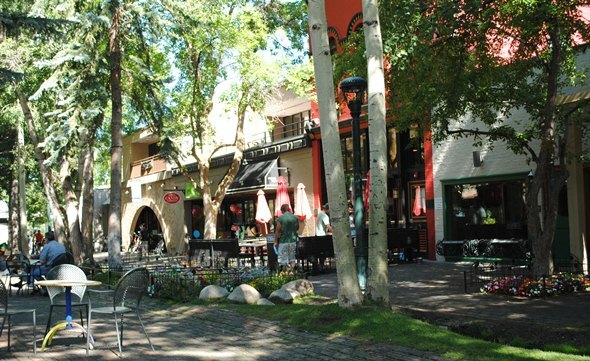 At the same time, Aspen has a small-town feel. The downtown is walkable, with historic commercial buildings two and three stories tall intermixed with modern ones no higher, pedestrian blocks on Cooper and Hyman avenues and Mill Street, and Wagner Park providing nearly two blocks of grassy area with rugby goalposts. The town’s wealth can be seen in the number of high-end restaurants and boutiques, including Ralph Lauren, Dior, Louis Vuitton, Prada, Gucci, Fendi, Bvlgari and Burberry. Even Aspen’s thrift stores carry high-end merchandise. The downtown lacks official historic status because of the modern buildings and the extensive reworking of some of the old buildings. But the residential neighborhoods on either side of downtown have well-preserved one- and two-story Victorian-era homes in wood and brick that qualified for the National Register of Historic Places. Rising on Aspen’s southern edge is the 11,212-foot Aspen Mountain, with the Silver Queen Gondola for the ski area also known as “Ajax” rising from among the shops on Durant Avenue. On the town’s northern edge are Red Mountain, which is packed with luxury homes, and the Roaring Fork River. To the east is Smuggler Mountain. Fortunes were made from silver mines under Aspen Mountain and Smuggler Mountain in the late 1800s, which produced $100 million worth of ore, and Aspen was built as a boomtown to serve the mines, with Victorian-era homes and commercial buildings. But most of those fortunes went to absentee mine owners instead of Aspen residents. Aspen’s ski industry is different, drawing wealthy part-time residents with a combination of skiing and the town’s reputation for glitz and glamour. Millionaires began moving in during the 1960s, followed by billionaires in the 1980s. Hollywood celebrities draw more attention, but oil, real estate, retail, financial moguls have more money. The Wall Street Journal called Aspen “the most expensive town in America” in 2011, based on a $4.6 million median sale price for a single-family home in the Aspen market, double that for Beverly Hills, in a study by San Francisco-based Altos Research. Aspen has four ski areas – the original Aspen Mountain, plus Buttermilk, Aspen Highlands, and Snowmass – all run by the Aspen Skiing Co. Aspen also has developed an off-season business as a convention, vacation, and cultural center, including the Aspen Institute and the Aspen Music Festival and School. The Aspen-Pitkin County Airport is Colorado’s third-busiest, with daily commercial flights. Private jets line the airport year-round. Land area: 3.5 square miles. County: Pitkin (Aspen is county seat). Altitude: 7,890 feet above sea level.